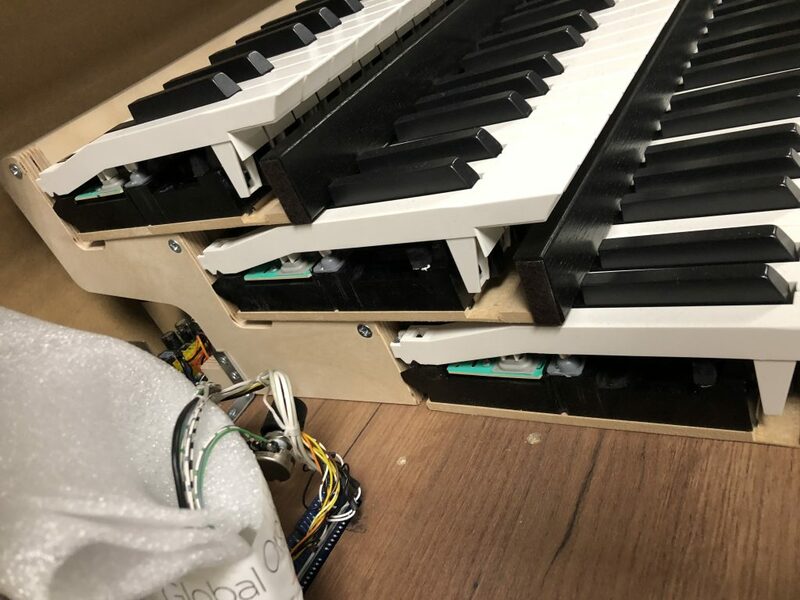 The following photographs were taken in July 2018 of a small digital organ manufactured in Holland. Well,…nothing has changed at all at Johannus! Still building them cheap,and mounting electronics directly on the wood. Not only that,…but they’re not even painting interior of the organ to protect the wood. SAD,…VERY SAD! I wonder if they’re building the new Rodgers Inspire series organs just as cheap. Wouldn’t be surprised if they are. It’s shame as to how much cost cutting is going on here just to get an organ out the door! Sorry, but that’s nothing but unfair and untrue competition bashing! Allen as one of the biggest global players in digital organs and the “host” of this forum should be much more relaxed, confident and HONEST! I know all the relevant global organ brands, their history, their advantages and disadvantages and not least their respective price points. Instead of just publishing photos and questionable comments, you should also be honest and tell your readers the price of the instrument you’re trying to discredit. Especially in this example, this would be a complete game changer, and I’m sure you know that. Allen did not need to talk about his competitors in a misleading and dishonest way. Why do you still show such bad behavior? We posted your comments as an example of sour grapes. You raise “honesty”, but do not offer one example of a posted item on the Blog that is not accurate. That is unfortunately a tactic taken by a salesman selling deficient products. Undoctored photos do not lie. The same cannot be said about all salesmen. Quality is a an objective product criteria that is not related to price. The fact that you complain about the photos of some digital organs indicate that you too are bothered by their low quality level. Your future comments will not be posted unless they are back by facts. It’s a shame that people can’t see these photos and see just how cheaply made a Johannus organ is! There’s no doctoring up of photos on this blog/website,…and,…as you said,…undoctored photos do not lie. Johannus is DEFINITELY not built to last. This blog,…Dave Carpent,…is backed up with facts and photos. And it’s an honest site,too. Nothing biased here! Dave Carpent,..there is nothing mis-leading,biased,or dishonest on this blog,…I see NONE of that here. Maybe the truth hurts that bad that photos don’t lie,and they are not doctored up. Allen does not operate that way. Not only that,the photos are backed up with FACTS,…or vice versa. All one need do is look at the photos showing how Johannus is made,and it’s BLATANTLY clear that they cut corners on construction,using particle/flake board to build consoles with,…mounting electronics directly on wood,not encasing the tone generation,power supply,and amps in metal cages to shield out EMI(electro magnetic interference). This blog’s purpose is to educate churches,and other customers on how an organ is built,…the philosophy of the builders,etc. Viscount,and Phoenix is not any different in the way they build their consoles,..and it shows. Rodgers seems to be following the same path of cheap construction. Insides of the consoles on these organs from Rodgers,Johannus,Viscount,and Phoenix not being painted to protect the wood says a LOT on their cheap construction. Unlike Allen,…those other builders are not building their organs to LAST! No bad behavior shown here,Dave! I see that this is an old comment. HOWEVER I must state that the example of this studio Johannus studio is built oout of Sullivan furniture quality and particle board. The Lower line of Allen is much much better built than this organ in the photos. What makes Allen to me a top winner is .. they for one have a video no videos of their factory tours and gabs of pictures of their organs whilst being built finished and on their brochures. I never seen inside pictures of Rodgers Johannus Viscount nor Phoenix It’s like they’re afraid of showing the “sins” inside. Till Johannus and the rest start doing such I have to say that Allen wins all around and they not only are a work of art but they sound as good as they are built. No I am NOT an Allen affiliate or spokesman but rather a spokesman of truth and quality. Allen knows they are the best and they are okay as a company regarding public relations but their quality is the best. I had a Lowrey Royale and a celebration C500 and they are much better built than the garbage I see on this blog. (excluding Allen of course) the ONLY part mounted on the console floor is the huge power supply. 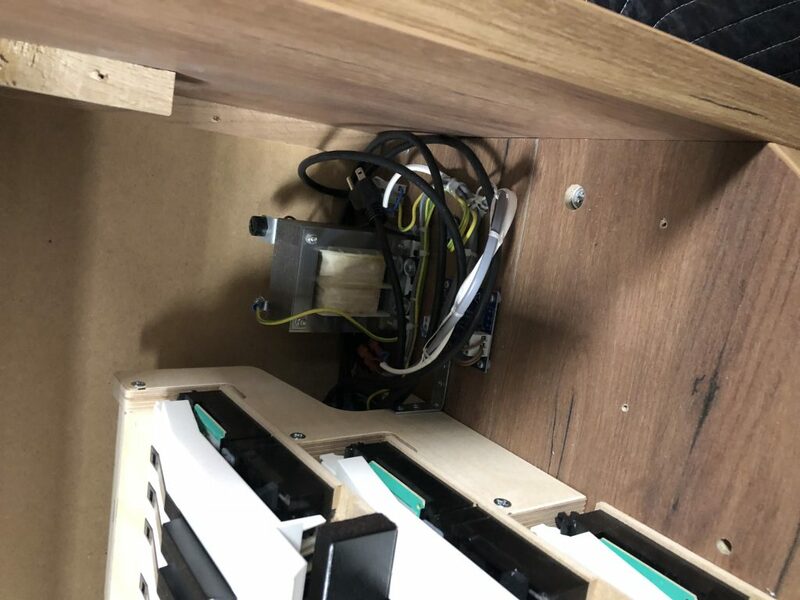 but the computer is mounted across the console in METAL cages and there are WHOLE lot more electronics in it than these organs and the inside is finished except for the shelf where the cage is bolted to. I would rather have a Lowrey than anything I see here. I am not an organ salesman nor a builder just an owner who got his Allen given to me by my best friend . Funny thing is. though I think after the MOS 2 they put the computers in cages. but mine has the tone generators on FINISHED wooden swing trays and they are grounded to a commins and the power supplies notice how I said it in plural not a power supply but power SUPPLIES, are all in cages and masterfully built. Do I like Allen as a company not really. they ignored me but who cares they parts ordering desk don’t ignore and you can get parts for any allen you have or repair. So I am going by MY OWN PERSONAL experience. and not from a professional or a shop owner’s perspective. So I am totally unbiased except for quality I EXPECT solid woods or birch plywood or Poplar butcher block core quality or it’s pure garbage. in organs and in any cabinet based product. If this was a speaker blog or a furniture blog I would feel the same exact way I do that I do on here. Tom, thanks for your comments. Glad you have been assisted with your parts requirements. Sorry you were not responded to on one occasion. Contact our sales office and reference this posting exchange and we will take corrective action. What bad behavior,Dave Carpent? I see none of that going on here. Photos are undoctored,and unedited,..and they do NOT lie,…and they are backed up by facts. Truth hurts,…the European builders take a LOT of short cuts in their manufacturing,and the photos show BLATANTLY CLEAR evidence of that. I mean,…who wants an organ made of flake/particle board? And that’s what these photos of the Johannus organ show. Making matters worse,…the interior wood of the organ is not painted to protect the wood(and it should be if you want the organ to last many years),and electronic assemblies are not protected in metal cages(they need to be in order to shield out EMI). Viscount and Rodgers are just as bad at the cost cutting at the expense of reliability,longevity,durability,and artistic philosophy. Looking at these photos again just appalls me at how cheaply Johannus builds their organs! Same with Viscount,Phoenix,and Rodgers. I have said this many times before,and I will say it AGAIN,…Allen is your best,..and only,..choice if you want an organ that is built to last a lifetime,have unmatched long term customer support(won’t get that with the others),be reliable,and have the best sound! I have heard the others,…and Allen STILL has the best sound over them! Yes Allens are wonderfully built I moved mine today and it took 3 of us WITH organ dollies and I still am hurting from the experience. Mine looks to be built of oak on oak core butcher block lumber. There is not ONE shred of particle board nor cheapness to it. It is OLD though it is a Mos2 which is fine. It sounds much better than you would think. I am enjoying my organ and it is beautiful and love those toe studs even those look so much better than the European offerings. you are right Allen is the only one for me and that is that. as I said before even LOWREY is better than the European stuff and they sound better too. Funny, played and owned Johannus organs all my life. Never had issues. Who cares how the inside looks like if it easily last 30 years or more. Beside that for me the johannus organs sound absolutely great and are very nice to play. My church has a Baldwin and every time I have to play it I would like to blow it up! Who cares what a product looks like on the inside? You are a salesman’s dream. Yes, and some Yugo’s worked just fine. But they were at least only a third the price of a Ford. Yep,..he’s a saleman’s dream alright! Well,…I would be the salesman’s worst nightmare in contrast to that because I want to see how things look on the inside as well. I’d DEMAND they remove the back off the organ so I could examine the interior. I CARE what it looks like on the inside! 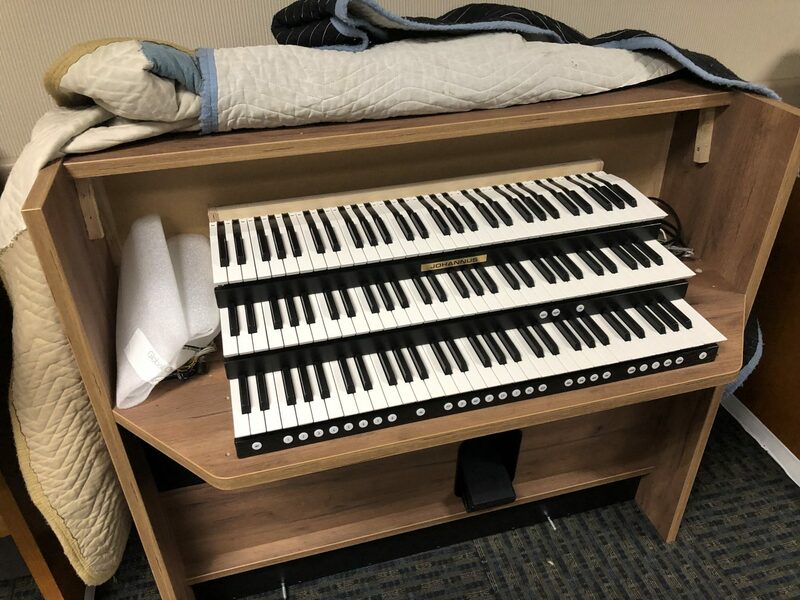 New or used,…I would be paying good money on that organ,and I expect it to LAST. He’s very lucky his Johannus has lasted this long considering how cheaply they are made. Never had issues? Hmmmmm! Well,…for his sake,..I sure hope he hasn’t. Parts will be scarce if problems develop! As a musician and a lover of quality sometimes I like too look inside my Allen and see what a work of art it is. How painstaking it was built with over sized power supplies and overbuilt keyboards and keydesks. Allen is the only console that looks as well made as traditional electro pneumatic pipe organ consoles. I bet that the European offerings don’t’ have a piece of oak lumber cored panel or top on anything they make. I have yet to see the inside of he Johannus Monarke. no one BUT ALLEN posts pictures of their innards nor have factory tour videos. That right there speaks VOLUMES of why Allen is the most envied builder of digital organs across the globe. and they are wonderfully made I am glad you had no issues with your European organ. AS per Baldwin I have an old 641 that is somewhat close to Allen but not there but much better than anything coming out of Europe. It will be a virtual organ to play with as I don’t want to get rid of it. Finally the insides is where everyone hides their “sins” you wouldn’t buy a car without opening the hood would you? taking the back off of an Allen is so easy too from my TC4 to my current one. two or three thumb fasteners and bingo you’re in.. What does Johannus have? and to be fair I never seen the innards off their flagship model the Monarke though saw a video of a Monarke installation in Houston and it has the typical lighted drawknobs Who knows. get yourself an Allen and come out off the darkness and live with an Heirloom quality piece Truth hurts I know but it sets us free. Tom,…I know of a Methodist church down in South Carolina that recently replaced an 11 year old Johannus organ with an Allen. The Johannus was becoming unreliable,and worse,..the organ was practically falling apart before their eyes,…it was sent to scrap. But then,…what do you expect of a European builder who DOESN’T bother to finish/paint the interior wood surfaces of the organ? 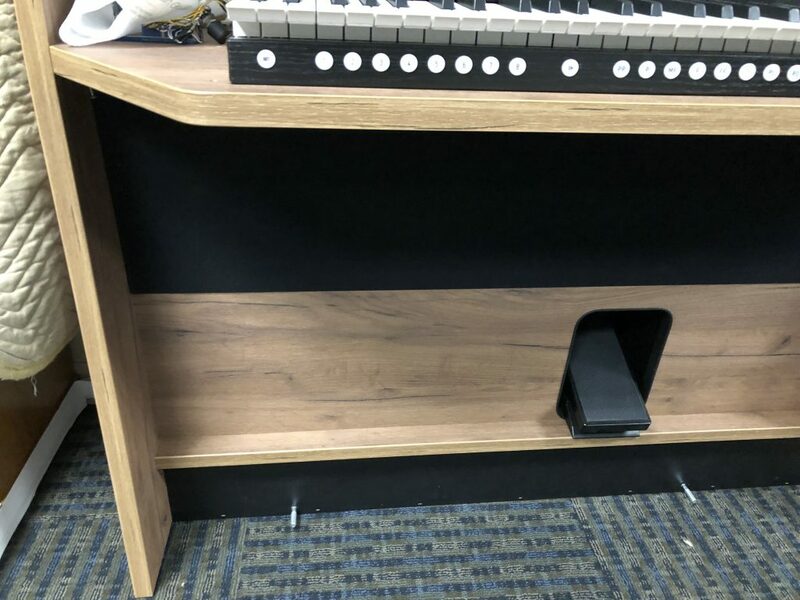 I seen photos on here of a plastic power supply,…that’s right,…PLASTIC covered power supply in that Johannus organ,…and mounted DIRECTLY to the console floor. Making matters worse,…unprotected circuitry. Viscount is not much better if you look at the insides of their organs on this site,…never seen such shoddy construction. Rodgers is no better,either! Yeah,…Rodgers and Johannus’ websites ARE unimaginatively boring to view,…and you are correct,…horrible navigation on those sites. Don’t know much about Phoenix other than what I see from the photos on this blog. Rodgers only offers THREE finish choices,…even on the largest console which you would think would be a much better quality,…but looking at their photos shows that it is not the case. As you said,…NOW,…go to Allen’s website. You get a history lesson,…all kinds of videos,…and a factory and museum tour. You can see the insides of their organs,and how well things are put together in there,along with tidy wiring. Do you get to see that on the Rodgers and Johannus sites? NOPE! That’s a RED FLAG,..and tells me they have something to hide! Just don’t see how a piece of unpainted wood affects the durability of an organ. If I look at my own organ, everything is unpainted wood and it’s from 1993 stil playing fine. Allen is your best,…and only,…choice if you want reliability,longevity,quality,and unmatched long term customer support,…things which you will NOT get from the others. I’m not an Allen sales person,tech,or affiliated with the company at all,…but hoping to soon to be an Allen customer/owner,…even if the organ I buy is pre-owned,…I know I’ll have a quality product that will most likely outlast me,..and if service is ever needed,…Allen will have the service parts to get it up and going again. Quality matters,people! I haven’t been on Allen’s site for a long time. I was invited to contact the sales and I will. I just wanted to reiterate that even their website reflects quality. The pictures are much higher quality than the rest. The layout is great and you could spend hours on their site. Go to the European companies their websites look like they were done by a high school kid. So again more proofs that Allen’s got it together. Yes Quality is worth more. Again I will talk to the sales department. Thank you for allowing me to post what I believe. Okay refresh.. I contacted Allen and I realized that I was the one that made the mistake. All is very very good with Allen they are friendly and they responded. So there is NO ONE that can convince me to go anywhere else ever for my organ needs be it a video or a part or maybe by the grace of God an organ. You do realize that this is the johannus studio 370 which sells for around 8500 us dollar in Europe right? Thanks for the pricing info. Real value involves price an quality. This organ fails the quality test. 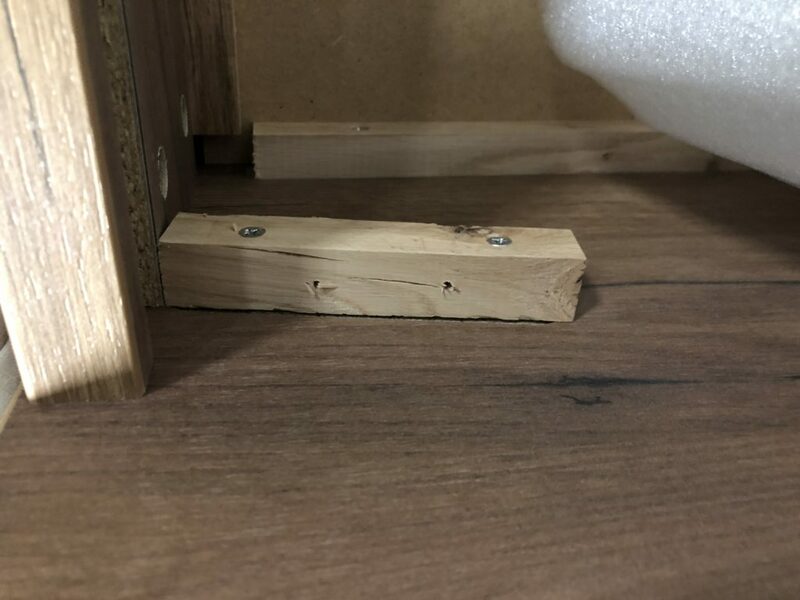 Boy does it ever fail quality test,…look at how it’s built,…particle board all the way through!